Posted on November 26, 2014 by Hawaii's Local Buzz. When you have guests over to visit this holiday season, serve them piping hot cups of Peaberry coffee. Their taste buds will delight in this rare treat, and your party will be an instant hit. 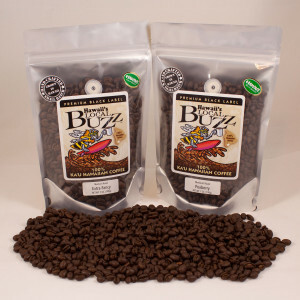 From now until the end of December, Hawaii’s Local Buzz is offering a special on Peaberry beans. Make sure you order yours soon to reap the benefits of our deep discounts. With our Black Friday special you’ll get 20% off the regular price on our Peaberry coffee beans, which is an especially good deal if you purchase a 5 lb. bag. Our 5 lb. bags of Peaberry coffee are ordinarily $240 , but if you purchase a bag during our sale, you’ll pay just $192. That’s a savings of almost $10 per pound of coffee! Remember, this price is only available while supplies last, and the supply of Peaberry beans is, in fact, limited. After all, that’s why Peaberry is such a special treat. Hawaii’s Local Buzz Ka’u Premium Peaberry Coffee is the most exceptional coffee you’ll ever sample. Peaberry coffee occurs when the two beans normally found inside each coffee cherry fuse together, forming one dense, flavorful coffee bean. Each Peaberry bean is more concentrated and flavorful than an ordinary coffee bean. Only 5 – 7% of any coffee harvest is comprised of Peaberry beans. Since we hand-select only the best coffee in the first place, even our Peaberry is a step above that of others. We offer our Peaberry beans in 2-ounce, 7-ounce, and 5-pound quantities, but we highly recommend buying the discounted 5-pound bags at this time of year. You’ll love serving this exceptional coffee to holiday guests, and it makes a delightful gift for your fellow coffee lovers, too. Visit Hawaii’s Local Buzz to discover more of our exceptional Hawaiian-grown treats. We offer raw, all-natural Hawaiian honey, high-quality artisan chocolate, delicious dehydrated macadamia nuts for snacking and baking, and of course our award-winning 100% Hawaiian Ka’u coffee. Happy Holidays!